After a number of teasing tweets from developer Gearbox, a formal trailer was shown at PAX East, showing off some of the new characters, environments, and guns making their way to the next entry in the shoot 'n' loot franchise. It's been over six years since Borderlands 2, though we haven't exactly been short on Borderlands in the meantime – there have been VR ports, additional DLC expansions, and a 'Pre-Sequel' follow-up to keep our trigger fingers busy. But fans have been clamoring for another fully-fledged entry in the series, and it looks like Borderlands 3 is finally on the way. With larger-than-life characters, a lively and colorful alien planet to explore, tons of absurd weapons, and a wisecracking sense of humor, Borderlands has managed to blow some fresh air into an FPS genre that often sticks to 'gritty' visuals and dull urban environments. Though we've seen two full trailers and a teaser, Gearbox is no doubt saving a bigger reveal for this year's E3 2019 convention in June. But what do we know about the newly-announced game so far, and when will it be landing on PC and consoles? That fits with what we learnt from publisher Take-Two's investor call last year, when Take-Two CEO Strauss Zelnick said a “highly anticipated new title from one of 2K’s biggest franchises” was in development for the fiscal year of 2019 – which runs between October 2018 and September 2019. The release date had technically been leaked through some leaked cover art (spotted by Wario64), but we know now straight from the horse's mouth. It looks... pretty much the same as any Borderlands game before it, which is both reassuring for fans and a bit disappointing for those looking for a new spin on the series. It's too early to judge before we've seen more, though. What we know for sure is that there'll be a lot of guns (over one billion, and even one with little machine legs) and a whole lot of looting in expansive sandbox environments. Oh, and a saxophone solo – because why not? The official announcement came only days after a 'Mask of Mayhem' teaser you can see below. It's packed with little clues and hints of the game to come, including everything from a morse code to braille, and what seems to be a broken-up redeem code (C35TB - WS6ST - TXBRK - JJH6H - TTTJT) that we imagine will be usable for some sort of DLC reward or exclusive skin for eagle-eyed viewers. Gearbox CEO Randy Pitchford hinted at this back in December, when he voiced his support for the new marketplace. Epic has been courting various exclusives for its store, including Metro Exodus and The Division 2, so we're not overly surprised. 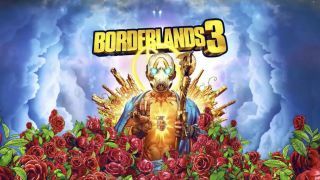 A listing page for Borderlands 3 on the Microsoft store gave a hint to a very-cool potential new feature landing with the game – cross-platform multiplayer. Though the page in question has since been pulled, it showed the game's feature set to include play across consoles not limited to Microsoft's own. With the game initially an Epic Games Store exclusive, and that platform's biggest title, Fortnite, being cross-platform in many console scenarios, there's certainly the genesis of the infrastructure to support the feature if true. The release date trailer also gave us the names of the four vault hunters, which offer their own spins on the traditional four classes. We have a Gunner weapons expert (Moze), a Siren with floating fists at the ready (Amara), an android Beastmaster (Fl4x), and a suave, stealthy Operative (Zane). We also got the names of the entry's villains: the very evil-looking Calypso Twins (not identical). Good news for anyone with a copy of Borderlands 1, 2, or the Pre-Sequel: Gearbox is releasing enhanced 4K remasters of the previous games, and anyone who already owns them will get to download the remastered version for free. You'll need a 4K ready console or PC to make the most of it, but it's wonderful fan service for those who do. After Tesla CEO and all-round benevolent billionaire Elon Musk released a 'Boring Company' flamethrower for sale as a reward for the community having purchased 50,000 hats, Gearbox CEO Randy Pitchford got in contact to see if he could put the gun in the "next Borderlands game." To everyone's surprise, Musk agreed to the bizarre request – making the Boring Company Flamethrower the first confirmed weapon in the unannounced game. Borderlands regular Mikey Neumann won't be writing on the new game, as he was unfortunately forced to resign from the project due to health complications. The lead writer on Borderlands 2, Anthony Burch, has also since left the company. There’s been no hint with regards to who’ll be taking up the pen after their departures.